The striking difference between the dark black paint finish of the chairs and the crisp natural wood coloring of the table creates a killer combination. Think of this as an update of the two-tone look - instead of a two toned dining table, this dining room set is two toned! Constructed of solid wood and made in the USA, this Greenbrier Craftsmen dining room table and chairs provides a stylish look that combines traditional quality craftsmanship with an updated look. Paired with this geometric rug, the dining room set stands out and becomes the focal point of the room, complementing the stonework on the wall and the room's architecture. Don't shy away from unique mixes! Extra toss pillows can quickly and easily change up the look of your living room. This trick is so easy that it allows you to change up the look of your room every season, or more if you want! Mixing fabric and leather in this room and pairing the rustic wood and metal occasional tables creates a comfortable and rustic inspired look. Think of the leather chair as your leather boots! When going bold, you can't go wrong with blue! This indigo blue wall is the perfect option for a bold hue that's not too bright and certainly not boring. 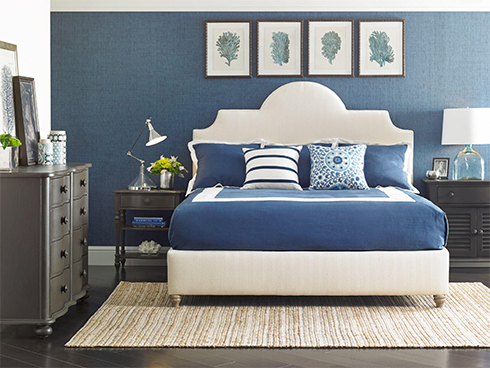 Paired with the dresser and nightstands from the Coastal Living Retreat Collection in the Gloucester grey finish and the white herringbone upholstered bed this bedroom has the perfect balance with a single contrasting statement. For more bold design ideas and inspiration, visit Belfort Furniture Park. Located in Dulles, Virginia, the Furniture Campus is filled with four unique showrooms in one convenient location. Need some design help? Send us more information like room dimensions, your design dilemma, your likes/dislikes, and maybe even a photo of your space and you'll receive a response with free design advice! Fill out the online form here.